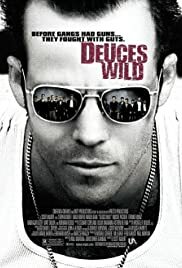 Bobby, a member of The Deuces, and the sister of the rival Vipers member fall in love, promoting a street war between the two factions. Marco: How's my sweet lil' Betsy doin? Courtesy of Megatrax Production Music, Inc. While this may have been nicely shot, it never succeeded in evoking a sense of 50's Brooklyn. A few visual cues gave away its west coast shooting location: nowhere in Brooklyn will you see shipyards like that, a beach with a pier closely resembling the Santa Monica pier, the same set/building that doubles as a courthouse in "Judging Amy, everything was just a little too clean. I found myself watching for silly continuity or production errors (one would hot have used a medicine bottle made of brown plastic with a white cap in 1958 and it's generally a good idea to make sure your magazine covers are spelled right....Photosecne?) instead of following the characters or the story. Also, fighting harder to actually get 50's music for the sound track would have greatly increased the sense of the era. High tech music and crunching sound effects cannot make up for the lack of the brutal reality of an actual New York street fight in the era. In many ways, West Side Story did a much better job although honestly and unabashedly a musical. It was filmed in the area now occupied by Lincoln Center. Perhaps, this film reflects much of what is wrong with studio productions: high production values, low filmic quality. By contrast, "Spiderman" was a lot more fun and did actually resemble New York to some degree.